A vase full of flowers can add beauty and elegance to a holiday table or a smile to the face of a new mother in the hospital. A bouquet of freshly cut roses, however, can be quite expensive, and, unfortunately, this investment may not last more than a few days. Help an aromatic floral arrangement last even longer by using common products that may already be in your kitchen pantry. Fill the vase half full with cool water. Place one tab of uncoated aspirin into the vase. Allow the aspirin to completely dissolve. Cut the stems of the flowers at an angle with a sharp, non-serrated knife and place them into the water. Cutting the flowers at an angle will help them more effectively absorb the water. Change the water and aspirin every two to three days. Recut the stems with the knife each time you change the water. The salicyclic acid in aspirin will help protect the plants from insects and mildew. Pour one-quarter cup of clear soda, such as lemon-lime, into the vase. Swirl the vase gently to incorporate the two liquids. The sugar in the soda helps the flowers thrive. Place the flowers into the vase. Change the water and add more soda every two to three days. Again, remember to recut the stems with a sharp knife. Mix two tablespoons of sugar and two tablespoons of apple cider vinegar in a small bowl. Fill a vase half full with cool water. Add the apple cider vinegar mixture to the vase. The apple cider vinegar, which is rich in potassium, will help make the flowers last longer. 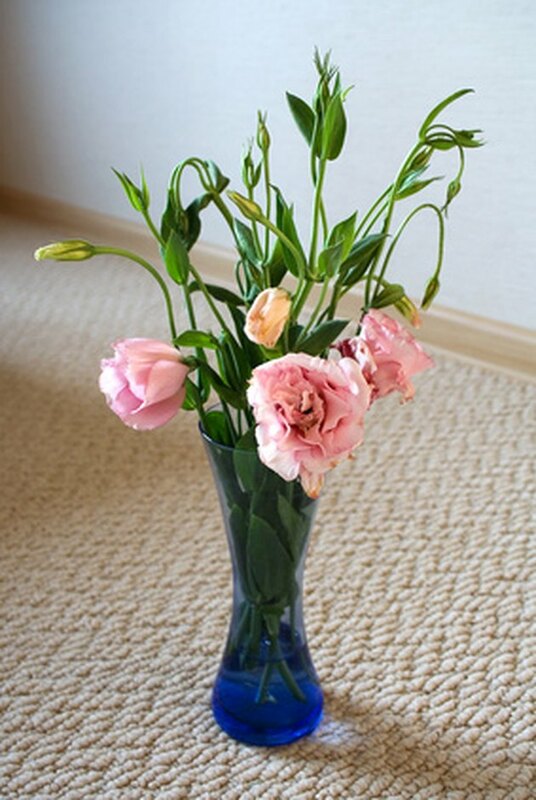 Place the flowers into the vase. Change the water and add more sugar and apple cider vinegar every two to three days. Recut the stems with a sharp knife to help the flower absorb the liquids more effectively. Fill a vase half full with cool water. Cut the end of the flower's stem with a sharp, non-serrated knife. Drop one penny into the water. Arrange the flowers in the water. The copper in the penny will help prevent fungus from forming on the flowers. Change the water and recut the stems with a sharp knife every few days. Drop the penny back into the water after each refilling. Does Soda or Water Make Plants Grow Faster?